I'm looking for a motor mount to use a 5682 size motor in a 1/8 buggy, preferably a Losi 8ight (but I'm open to suggestions for other candidates) and preferably a one-piece design including the rear center diff bulk. 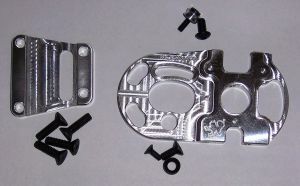 All I could find so far are the 2028/58XX Universal Brushless Motor Mount and a 56/58 mm mount for the Kyosho GT2, both from Kershaw Design (pics below). Anyone know any alternatives? Wouldn't mind a custom RC-Monster mount either :). Last edited by Dr_T; 11.12.2014 at 05:08 PM. Thanks for chiming in Arct1k. I think the real problem with the mounts intended for 40mms is not so much the height, as that can be shimmed indeed (was my first plan with the standard Losi mount too), but the 30mm mounting hole distance, instead of 25mm. This means the motor needs to be mounted a bit rotated, causing sqrt(15^2-12.5^2)=8.3 mm of max gearing range to be 'lost' (basically reducing max pinion size with 17 mod 1 teeth). On a typical buggy I would need at least 48/35 (pinion/spur) gearing (43.5 mm shaft distance with mod 1 gears) to make it useful. Do the RCM mounts for standard 40 mm motors accommodate that you think, given 8.3 mm sliding space is lost with a 56mm motor? Putting some numbers on it actually made me realize the 8ight platform is not that suitable with its off-center diff, as the required gearing would put the motor partly outside of the car (great for cooling though!)... Thinking an MP9e would be a better candidate now, but open to suggestions for other platforms. Also wondering about a GT2, but think I want something a bit more robust at non-smooth surfaces. Ah, thought it was a 2 slot slider mount like the 5T one, but just realized the RCM mount for the 8ight is a rotating one, so that means 30 mm mounting hole distance is out of the question anyway, like with the Losi mount. Last edited by Dr_T; 11.13.2014 at 07:04 AM. Sounds like you are going for a speed run car. Would look to gtp / dm1 platform. The centre diff is a spool and you could go down as small as you want by replacing spool with a large pinion gear. Yeah, I didn't want to clutter the first post so much with too much details about goal right away. 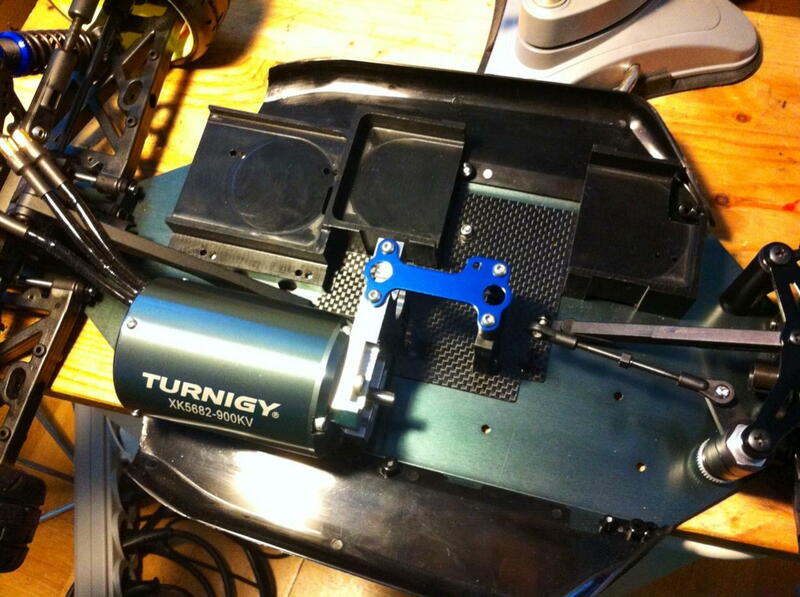 I'm not looking for a "single pass" Guinness speed record breaker, but rather want something that can do around 90-100 mph reliably, for a full battery and on surfaces that might not be the smoothest and appropriate for true GT speeds - something similar to what I can do with my 8ight-T: http://www.rc-monster.com/forum/show...945#post428945, but a little bit faster, lighter and better handling. Something that makes going full throttle feel a little bit less like playing Russian Roulette :). I'm reading that a lot of guys seem to prefer buggies for "real world" road speed machines over GTs, as buggies handle uneven surfaces a bit better. Hence my initial choice for buggy. My preference for the 8ight comes from the "common spare part pool" that would give with my 8ight-T. That being said, the set-up in the vid below looks pretty cool too, and I'm wondering whether such a GT can be set-up for crappy streets as easy as a buggy can be set-up for on-road use. Last edited by Dr_T; 11.13.2014 at 11:45 AM. Last edited by x-y; 11.13.2014 at 11:54 PM. Buggy became GT2 and center diff became spool. Still work in progress, but motor mount question: case-closed. Thanks!